Visiting Panjiayuan is an experience in itself - whether you actually choose to buy something or not. 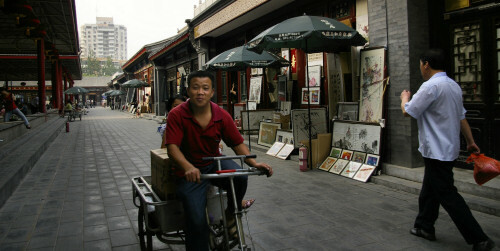 The market is located a couple of miles east of the Temple of Heaven. In the large courtyard, salesmen sit in rows with blankets filled with various jewellery, statuettes, vases, china, Mao-related items and more curiosities. To get the best experience, go there on weekend mornings, when the most salespeople are in position. But even if you are not an early riser, there is a good chance that you will find something here. Besides those of the yard sellers who choose to stay until closing time, there are a hundred or so small shops around the yard. Here you will find art, pearls and jewellery, apart from more of what we already mentioned. If you do not speak the language, it can be difficult to maintain any longer dialogue since most of the salespeople do not speak English. The negotiability of the prices varies a lot depending on the individual salesperson. Sometimes you hardly need to bargain at all. In the shops surrounding the yard, however, you should bargain harder.